Here we are in week 2 of computer organization month…aren’t you just loving your newly organized computer desktop? Now that’s we’ve got that desktop clutter under control, we’ll spend some time creating a computer backup system. If you already have a backup system in place, take this opportunity to see if you can improve upon your existing system. Hard drives crash. Computers get lost and stolen. Natural disasters happen. Despite these basic facts, I chose to gamble with my data files for years by operating without any sort of computer backup system. I eventually paid the price when I experienced a hard drive crash and lost a ton of valuable documents and photos. Once you live through this experience, you spend quite a bit of time smacking your palm to your forehead, wondering why on Earth you didn’t take some simple steps to prevent the tragedy. Learn from my mistake and save yourself the aggravation and heartache by completing this week’s assignment! As I wrote about in this post outlining the steps for creating a digital photo backup system, there are two key features of an effective computer backup system: redundancy and automation. Simply put, redundancy means that your data is backed up in multiple locations. More specifically, your backup system should consist of at least 3 copies of your data in at least 2 physical locations. Think about it. If your home is flooded or destroyed by a fire, a secondary backup contained on a hard drive in your home won’t do you much good. 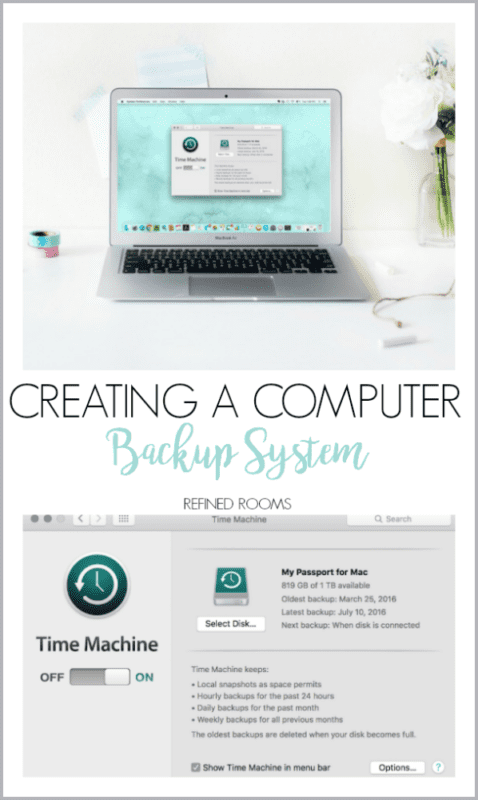 When setting up your computer backup system, it’s ideal to make it as automated as possible. The less your system needs to rely on you to manually do something to make it work, the better. Creating a system that works in the background with little effort on your part is key. Using an external hard drive (EHD) with pre-bundled automatic backup software is my method of choice for an onsite backup. 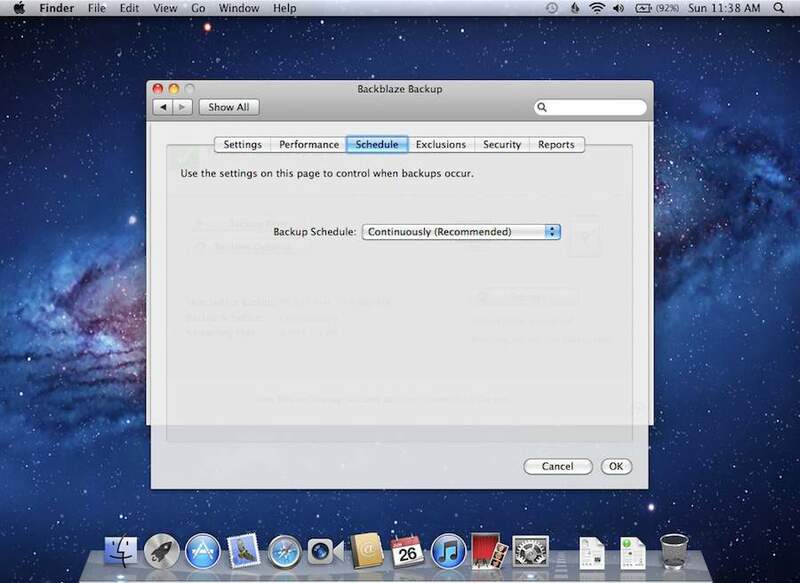 If you keep the hard drive continuously connected to your computer, it will maintain a consistent, real-time backup of all of your files. You can purchase EHDs that are formatted for either a PC or a Mac. 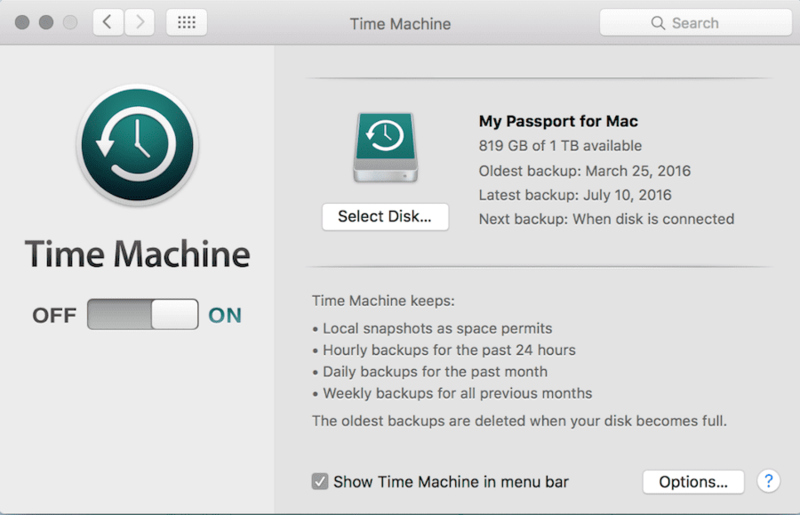 The Time Machine application is built into newer Macs and just requires an EHD formatted for Mac. Another option for creating an onsite backup is to manually backup your files onto a USB flash drive. The storage capacity of the flash drive is significantly less than what can be stored on an EHD, so this method would only work if your backup requires 64 gB of space or less. Despite the existence of software that automates the flash drive backup process, the disadvantage of the flash drive is that it requires you to remember to plug it in periodically. There are a ton of options when it comes to online data backup services. I’ve used several different services over the past few years and am now a die hard Backblaze user. Backblaze automatically backs up every type of file on my computer, unlike other services that exclude certain types of files (e.g., video/music) by default. The true test of a cloud backup service comes when you actually need to retrieve your data after a loss. That happened to me last year, and I’m happy to report that the data retrieval process was successful (and relatively pain-free!). Take some time to research the various options that are currently on the market (there are new services popping up all the time). Just make sure to choose a service that backs up ALL of your files and does so continuously and automatically. If you’re not comfortable storing a backup of your data in the cloud, you can choose to store a copy at a secondary location. The old school (i.e. manual) way of doing this would be to back up your data to an EHD or flash drive on a regular basis (e.g., weekly) and transport it to an offsite location (e.g., friend/relative’s home, your workplace, etc.). As you can imagine, there’s a lot of opportunity for your backup system to break down, since this method is by no means automatic and requires a good deal of continuous effort on your part. There is an alternative…Crashplan’s free offsite backup service. 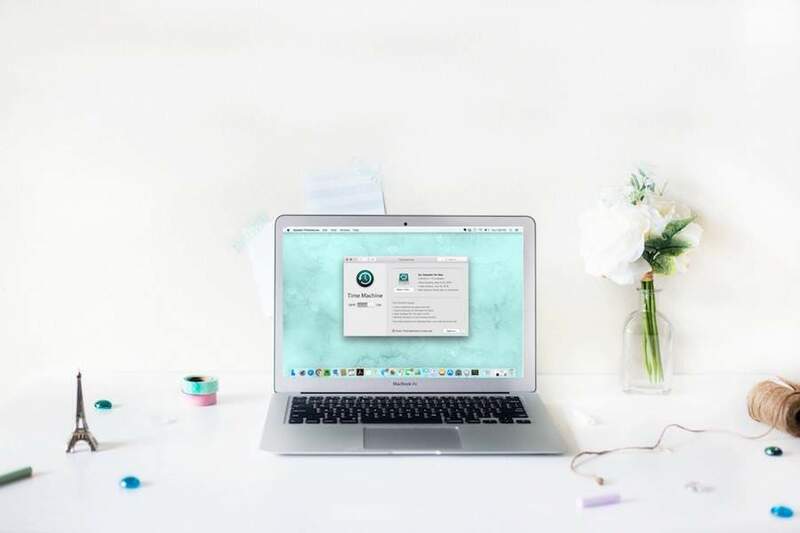 This service allows you and a “backup buddy” of your choosing to serve as each other’s automatic offsite backup (your data is automatically and continuously backed up to their computer and vice versa). Let me know what’s included in your computer backup system in the comments below! My documents are sync’ed with OneDrive and automatically back up to JustCloud daily. I removed my photos from that loop because they sucked up all the wi-fi whenever I copied them over from my SD card or edited a bunch, so they get backed up to JustCloud automatically and to an external hard drive manually once a week or so (still fine tuning the process). Great informative post on backup systems. We did this recently. As a small business owner, there is a little more care involved when it comes to back up systems. I had to not only make sure my data is backed up but I also had to make sure my clients’ data is backed up as well since they don’t normally back up their own data. I also do the 3 locations backup for their data. I also noticed that some systems just stop working, so periodically checking to make sure the backup system is working is important. I add it to my calendar once a month to remind me to check the backup. Yes, Sabrina…a rock solid backup system would be even more crucial in your situation. I’ve also had the experience of realizing that there’s a snafoo in the system…a hard drive went bad, I inadvertently turned off a setting in my cloud backup, etc. Totally concur with the thought that routine checks must be part of the the maintenance system. Thanks for sharing your thoughts on this!